After I habitually took the list of the June achievements and crossed out the unneeded (i.e., the games that either were or will soon be annotated), I found there are four games left. Get ready for them. The Internet knows no geographic boundaries, but I feel the management of the site and the reader will appraciate my delicacy if I begin with a bright victory of a St. Petersburg grandmaster. 1.d4 ¤f6 2.c4 e6 3.¤f3 d5 4.¤c3 c6 5.e3 ¤bd7 6.a3. Тhe ex-world champion Stefanova opened one of her recent games in Krasnoturinsk (against Chiburdanidze) with 1.d4 d5 2.a3. Prophylactic thinking gradually becomes common! Speaking seriously, this way of preventing the Meran had already been seen in the practice. 7.g4. Anovelty! 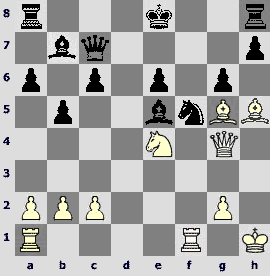 After 6.Јc2, 7.g4 occurred like thousand times, but it has never been seen after 6.а3. Yet, it is easy to understand that the queen move is more useful in general – White participates in a struggle for the e4-square in a more direct way, and the modest pawn move does not aid the queenside development. However, Black now has to solve completely new problems. One has to understand at the board, which of the typical continuations – 7...¤xg4 8.¦g1 ¤xh2 9.¤xh2 Ґxh2 10.¦xg7, or 7...dxc4 8.Ґxc4 (8.g5), or 7...h6 – exploits the opponent`s modesty in the best way. Maybe even 7...0-0 should be considered, which is dubious after 6.Јc2, as in this variation Black can meet 8.g5 by 8...¤e4. Alas, Epishin`s move rules out one of the main responses to the Shabalov-Shirov system, 7...Ґb4. 7...b6. A modest pawn move in return passes the opening initiative to White. 8.g5 ¤g8. More enterprising is 8...¤e4 9.¤xe4 dxe4 10.¤d2 f5 11.gxf6 ¤xf6 12.Ґg2, but here it is hard to think out anything better than castling, which means that in the variation 7...0-0 8.g5 ¤e4 9.¤xe4 dxe4 10.¤d2 f5 11.gxf6 ¤xf6 12.Ґg2 Black played 12...b6? instead of energetic and strong 12...е5. Godena is probably right – having played 7...b6, Black should keep low profile. 9.cxd5. Keeping the tension by 9.e4 is also possible. 9...exd5. In case of 9...cxd5 Black will later have to spend a tempo to cover the b5-square. 10.e4 ¤e7. 10...dxe4 looks worse – 11.¤xe4 Ґc7 (in case of 11...Јe7 12.Јe2 the g8-knight has no clear prospective) 12.Јc2 ¤e7 13.Ґd2, and the е4-knight gets a greater scope that in the game. 11.exd5. Of course, not 11.e5 Ґc7 followed by ¤f8 and simple light-squared play. 11...cxd5. Another capture deserves closer attention (in case the line settles, of which I am not sure at all) – 11...¤xd5 12.¤xd5 cxd5. After 13.Ґd3?! 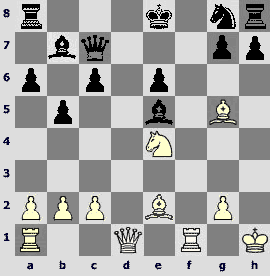 0-0 14.Јc2 Black can do without weakening the kingside – 14...¦e8+ и ¤f8. 12.Ґd3 0-0 13.Јc2 g6. Clearly, after 13...¤g6 Godena worried about the h-pawn advance. After the text he can at least ignore the pawn`s appearance on h5. 14.h4. Probably a bit too reckless. It is better to complete the development by 14.Ґe3 and 0-0-0. 14...¦e8 15.h5 ¤f8. Pointlessis 15...¤f5+? 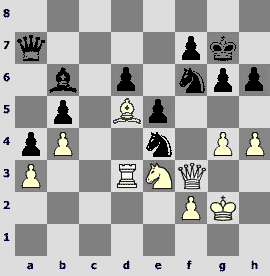 16.ўf1, however, in general the opposition of the king and the rook should not be disregarded. 16.hxg6 fxg6. 16...¤exg6+ is a good alternative to the text: 17.Ґe3 Ґg4 18.Ґe2 Ґf4. 17.Ґe3 Ґg4 (not 17...¤f5 18.¤xd5) 18.Ґe2 ¦c8. 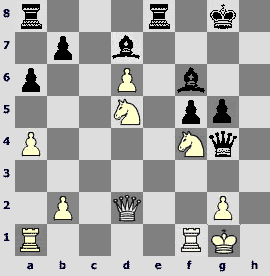 Black could activate another rook first – 18...¤e6 19.Јb3 ¦f8. 19.Јb3 ¤e6 20.¦h4. Loses 20.¤xd5?? ¤xd5 21.Јxd5 Ґb4+. 20.ўf1 is probably better, creating a simple threat to capture on d5. Although even without a pawn Black has the right to claim counterplay. 20...Ґxf3 (worse is 20...Ґf5 21.ўf1) 21.Ґxf3. 21...¤f5? A decisive mistake. Correct is 21...¤xg5! However, it is easy for the annotator to advise and mark the moves, while at the board choosing between two similar-looking knight moves is far from obvious. In the position after 22.Ґxg5 ¤f5+ 23.ўf1 Јxg5 24.Јxd5+ ўh8 25.¦h3 Black is clearly not worse, despite being a pawn down. After 22.Ґxd5+ ўh8 White faces great dangers, because four Black`s pieces have accumulated a colossal potential – the knight is ready to move to d5 or f5, the bishop will easily find a good use on one of the diagonals, а3-f8 or h2-b8, and the rooks eagerly await the right moment to capture one of the opponent`s minor pieces. These are some illustrative lines – 23.0-0-0 ¦xc3+ 24.bxc3 ¤xd5, and the check from a3 follows if the knight is captured; or 23.¦g4 ¦xc3! 24.bxc3 ¤xd5 25.Јxd5 ¦xe3+!, and the check from g3 follows the rook capture; or 23.ўf1 ¤f5, and White feels sick again. The best is 22.Ґg4 ¤f5, and now not 23.Јxd5+ ўh8 24.Ґxf5 ¦xe3+ 25.fxe3 ¦xc3 or 25.ўf1 ¦exc3 26.bxc3 gxf5 with difficulties, but 23.Ґxf5 ¦xc3 24.bxc3 ¤f3+ 25.ўe2 ¤xh4 26.Јxd5+ ўh8 27.Ґe4 Јf6, and the game is about even. 22.Ґxd5! The feast begins, and White consumes a lot more healthy food. 22...¤xe3. After 22...¤xh4 23.Ґxe6+ ўh8 24.0-0-0 and d4-d5 White has a gorgeous attacking position. 23.Ґxe6+. Better than 23.fxe3 Ґg3+ (no good is 23...Јxg5 24.¦e4! Јg1+ 25.ўd2 Јxa1 26.¦xe6, and Black loses material) 24.ўd2 Ґxh4 25.Ґxe6+, although White keeps the advantage after both 25...ўg7 26.Ґxc8 Јxc8 27.¦f1, and 25...ўh8 26.Ґxc8 Јxc8 27.¦h1. 24.¦e4! The provincial rook has finally obtained a key role in the scene. 24...Јxg5 25.Ґxc8 ¦xc8 26.Јe6! Had Black retreated to h8 on the 23rd move, the c8-rook would hang with a check, and we would have been deprieved of the spectacular finale. 26...Јg1+. 26...¦d8 loses to 27.¦xe3 Јg1+ 28.ўd2 Јxa1 29.ўc2!, and in view of the threat ¤e4 Black can`t avoid material losses. 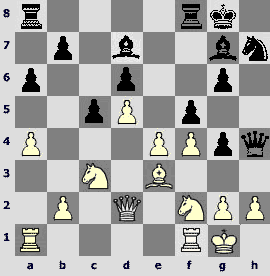 28.Јd7+ ўh6 (fortunately the Italian grandmaster does not spoil the beauty) 29.¦h4+ ўg5. 30.¤e4+! 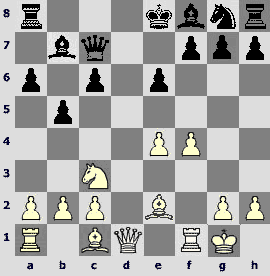 Vladimir forces the mate by the rook sacrifice. 30...ўxh4 31.Јxh7+ ўg4 32.f3+. 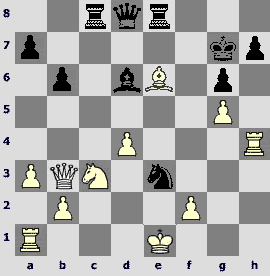 Black resigned in view of 32...ўf5 33.Јf7# or 32...ўf4 33.Јh4+ ўf5 34.Јf6#. Also in tiny San Marino, the small Indian talent lost the following game to the experienced Bulgarian fighter. 1.e4 e5 2.¤f3 ¤c6 3.Ґb5 a6 4.Ґa4 ¤f6 5.0-0 Ґe7 6.¦e1 b5 7.Ґb3 d6 8.c3 0-0 9.d4 Ґg4 10.d5 ¤a5 11.Ґc2 Јc8 12.¤bd2 c6 13.b4 (more popular is 13.h3 Ґd7) 13...¤b7. Recently Black started playing 13...¤c4 with the following sample continuation: 14.¤xc4 bxc4 15.dxc6 Јxc6 16.h3 Ґd7 17.a4. 14.dxc6 Јxc6. Despite his tender age, Negi already has a decent experience in this scheme. In Abu Dhabi 2005 Grogoriants tried an experimental 14...¤d8 against him, but after 15.¤f1 ¤xc6 16.¤e3 a5 17.¤xg4 ¤xg4 18.Ґd2 Black is far from reaching the equality. 15.Ґb2 ¤d8. Negi opponents tested 15...¤d7 16.Ґb3 twice, but both were mated in process. Vijalakshmi in New Delhi selected 16...ўh8 17.c4 Јb6 18.cxb5 axb5 19.h3 Ґe6 20.¤f1 ¤d8 21.¤e3 Јb7 22.Ґd5 Ґxd5 23.Јxd5 and lost in the endgame, and Hebden in Hastings 2005 went for 16...Ґxf3 17.Јxf3 Ґg5 18.¤f1 ¤b6 19.Јg4 Ґf4 20.g3 Ґh6 21.Ґc1 and lost to a neat middlegame combination. 16.¤f1 ¤e6 17.h3. 17.¤e3 led to a spectacular play (which soon ended in a draw by agreement) in Ponomariov-Svidler, Panormo 2001: 17...Ґh5 18.¤f5 ¦fe8 19.Ґb3 ¤g5 20.¤xg5 Ґxd1 21.¦axd1 h6 22.¤xf7 ўh7. 18...Ґxf3. The theoretical part is concluded by quoting the games in which Black played 18...Ґg6. After 19.¤h4 ¦fd8 20.Јf3 d5 21.exd5 ¤xd5 22.¤xg6 hxg6 23.¦xe5 Ґf6 24.¦xd5 ¦xd5 25.Ґb3 ¦ad8 26.Ґxd5 ¦xd5 Smagin got a good counterplay for a pawn against Volokitin (Ekaterinburg 2002). 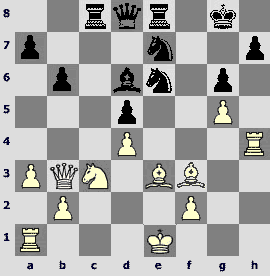 Najer improved the White`s play in Dagomys 2006 (against Akopian) by 20.¤gf5 Ґf8 21.Јf3 d5 22.exd5 Јxd5 23.Јxd5 ¦xd5 24.¤xg6 hxg6 25.¤e3 ¦d7 26.a4. The Black`s position looks precarious, although Akopian skilfully and without any signs of effort held this ending to a draw. One should also mention recent Dovlyatov-Belov game (Baku 2006), in which Black did not experienced any difficulties after 19...¤f4 20.¤gf5 ¦fe8 21.¤xg6 hxg6 22.¤xe7+ ¦xe7 23.h4 ¦d8 24.g3 ¤4h5 25.Ґb3 d5. 19.Јxf3 g6 20.Ґb3 (threatening 21.Ґd5) 20...¦ac8 21.¦ac1. 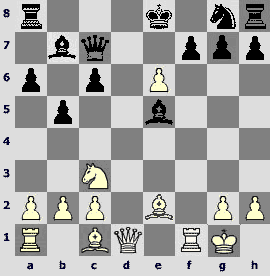 After the Black`s rook left the a-file, 21.a4 seems logical. 21...Јb7. Black neutralizes the с3-с4 advance. Choosing the b7-square can be explained by the wish to keep the pressure on the e4, as well as not to lose a tempo on taking the a5-pawn after a6-a5, b4xa5. However, 21...Јb6 isprobablystillmoreaccurate. 22.¦cd1. An attempt to activate the dark-squared bishop by 22.¦c2 is interesting: 22...¦c7 (22...a5 23.bxa5 Јa7 24.Ґa3 Јxa5 25.Ґb4 plays into White`s mood if not his hands) 23.Ґc1 ¦fc8 24.Ґh6, and the tactical 24...¤d4? 25.cxd4 ¦xc2 fails to 26.¤h5! gxh5 27.dxe5 (an important intermediate move!) 27...dxe5 28.Јg3+ ¤g4 29.hxg4, and Black stands badly due to hanging e5-pawn (without exchanging on e5 he would have a defensive resource h5-h4). 22...¦c7. White`s windmill begins to work after 22...a5? 23.bxa5 ¤c5 24.Ґa3. 23.¤f1. In case of 23.Ґc1 ¦fc8 24.Ґd2 the White`s dark-squared bishop is temporary less energetic than in the previous note, however, one should not rule out the possibility that the bishop is better off on the с1-h6 diagonal. 23...¦fc8. The knight`s departure from g3 did not weaken the e4-pawn much – 23...¤g5?! 24.Јe3 ¤gxe4? 25.f3, and greed is being punished. 24.h4. 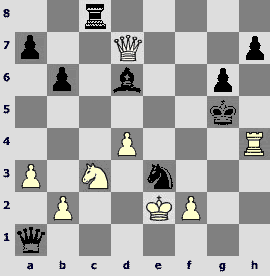 Before sending the knight to е3, White prevents ¤g5. 24...a5 25.¤e3. 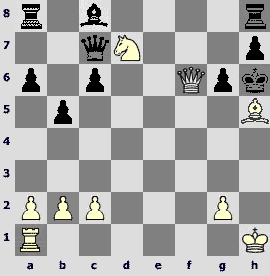 In case of 25.bxa5 ¤c5 26.¤g3 ¤a4 Black gets the initiative. 25...a4. Starting here, the players had to weighten the consequences of the exchange sacrifice on с3. Now 25...¦xc3 26.Ґxc3 ¦xc3 is unlikely to work due to 27.Ґxe6 fxe6 28.bxa5: the Black`s king is unsafe, and the passed pawn on a5, although hardly dangerous, is annoyingly distracting. 26.Ґd5 Јa7. The advantages of such queen deployment are supporting the а4-а3 push and an opportunity (which was used in the game) to bring the bishop to b6. The advantages of 26...Јb6 lie in more solid defending of b5 and d6 pawns, which is probably more important for the Black`s general plan. 27.a3. Poor bishop placement in the line 27.Ґxe6 fxe6 28.¦xd6!? 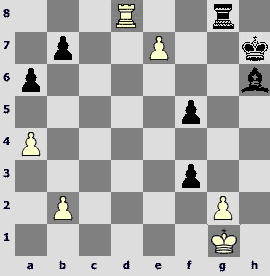 a3 29.Ґa1 Ґxd6 30.Јxf6 ¦f7 31.Јxe6 Јd7 prevents White from enjoying compensation for an exchange. 27...¤f4. Here 27...¦xc3 28.Ґxc3 ¦xc3 29.Ґxe6 fxe6 30.Јe2 is more justified than it was two moves before, however, certain friability of the pawn structure is disturbing. 28.Ґa2. After 28.g3 ¤4xd5 29.¤xd5 ¤xd5 30.¦xd5 Јb7 Black covers the b5-pawn by placing the rook to с4, and White`s poor dark-squared bishop as well as weakness on c3 begin to tell. 30.g3 ¤4h5. Probably I already convinced you that Delchev disliked the position after exchanging on е6, and in case of 30...¦xa3 31.Ґxf7+ ўxf7 32.gxf4 the Black`s king is once again too open. Nevertheless, decentralizing knight maneuver is likely weaker that any of those options. 31.Јe2! ¤xe4. After 31...¦xa3 32.Јb2! Black has to part with another exchange – 32...¦xa2 33.Јxa2 ¤xe4 34.¤d5. This is too much. 32.¦d3. Not utilizing a primitive idea inhered in the previous move. After 32.Јxb5! White threatens check from е8 and double attack from d5. He stands better in all the variations, e.g., 32...¤hf6 (32...¤ef6 does not appeal) 33.Јa5!, driving the queen away from the dangerous а7-g1 diagonal, or 32...¦xa3 33.¦a1! (not 33.Јd5 ¦xa2 34.Јxa2 ¤c3). 32...¤hf6 33.¦ed1. The idea to distrub the е4-knight by 33.g4 Ґd8 34.f3 is doubtful. Black may choose between 34...Ґb6 35.ўg2 Ґxe3 36.¦xe3 Јc7 and 34...¤xg4 35.fxg4 Ґxh4 with excellent counterplay. 33...Ґd8 34.Јf3. Here 34.g4 is associated with another idea, which is seen in the line 34...Ґb6 35.g5 ¤h5 36.Јf3, however, White has to take a wild sacrifice on f2 into the account, and the backup solution 34...h6 35.g5 hxg5 36.hxg5 ¤h5 37.¤g4 leads to a double-edged struggle. 34...¦xd3 35.¦xd3 Ґb6 36.ўg2. 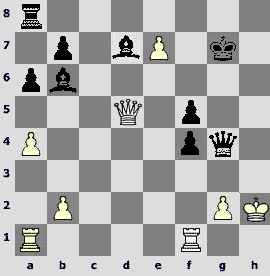 36.Ґd5 ¤xd5 37.Јxe4 (37.¦xd5 f5) 37...¤xe3 38.fxe3 f5 39.Јd5+ ўg7 is not good for White. The е3-pawn falls (40.ўf2 does not help: 40...Ґxe3+ 41.¦xe3 f4), Black brings the bishop to d4, and then he is very likely to break into the enemy camp with the queen. However, a hard-to-digest line 36.¤d5 ¤xd5 37.¦xd5 Ґxf2+ 38.ўg2 Ґxg3 39.¦xb5 Ґxh4 40.¦a5 Јe7 41.Јxe4 Јg5+ seems to end the game peacefully. 36...ўg7 37.g4?! 37.¤d5 is stronger here, too. White spoils the game with his last pre-control moves. 38...¤xf2! Careful study of this game shows all inaccuracies by both players, however, the decisive combination is executed perfectly. 39.ўxf2. 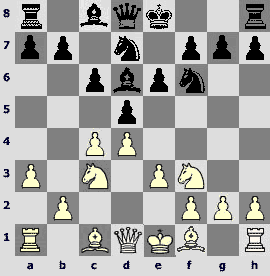 In case of 39.Јxf2 ¤xg4 40.¤xg4 Ґxf2 41.¤xf2 f5 White is helpless against the advancing pawns. 39...Ґxe3+ 40.¦xe3 Јd4! An excellent quiet move, securing Black`s decive advantage. 41.Ґa2. On 41.Ґe4 Black plays 41...d5. The most stubborn is 41.ўf1 ¤xd5 42.¦d3 Јa1+ 43.ўf2 (43.¦d1 Јxd1 44.Јxd1 ¤e3+), but after 43...Јb2+ and 44...¤f4 White has difficulties repulsing combined attacks of queen and knight. 41...¤xg4+ 42.ўg3 (42.ўe2 Јb2+) 42...Јxe3. The White`s queen must be pinned so that it could not even think about capturing the f7-pawn! 43.ўxg4 f5+ 44.ўg3 Јg1+ 45.ўh3 h5 (the computer insists on 45...ўf6 for some reason) 46.Јg2 Јe3+ 47.Јg3 Јc1 48.Јg5 Јf1+ (simpler is 48...Јxa3+, taking the bishop; there is no stalemate anywhere) 49.ўg3 f4+ 50.ўh2 Јf2+ 51.Јg2 Јxh4+ 52.ўg1 ўh6 53.Ґf7 Јf6 54.Ґe8 Јf5 55.Ґc6 Јb1+ 56.ўf2 Јb2+ 57.ўg1 Јxa3. One who can count shall count. Black has 6 pawns for a bishop. 58.Јe4 Јc1+ 59.ўh2 Јd2+ 60.ўh1 a3 61.Ґe8 Јd1+ 62.ўh2 Јg4 63.Јc2 Јg3+ 64.ўh1 Јe1+ 65.ўh2 e4 66.Ґc6 f3 67.Ґxe4 Јe2+. White resigned. The following game appeared in our collection thanks to grandmaster Mikhail Prusikhin, who also supplied it with nexessary variations. All I had to do is add words. 1.d4 g6 2.c4 Ґg7 3.e4 d6 4.¤c3 ¤f6 5.f3 0-0 6.Ґg5 c5 7.d5 e6 8.Јd2 exd5 9.cxd5 a6 10.a4 h6 11.Ґe3 h5 12.¤ge2 ¤bd7 13.¤d1. 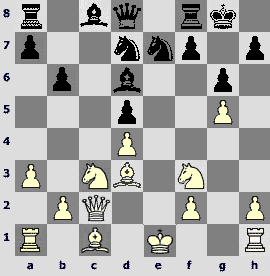 The light-squared bishop develops a move faster after 13.¤c1. 13...¤e5 14.¤ec3 ¤h7 15.Ґe2 f5 16.0-0 Ґd7 17.¤f2. This position already occurred in practice of the White player. Hochstrasser-Schaufelberger (Switzerland 2003) continued 17...¤f6 18.f4 ¤f7 19.e5 dxe5 20.Ґxc5 ¦e8 21.¤d3 ¦c8 22.fxe5 ¤xe5 23.¤xe5 ¦xe5 (23...¦xc5!?) 24.Ґf2 with unclear game. In general, this line of the Modern Benoni favors one who handles the limited amount of strategic ideas better (can`t it be said about chess in general by the way?). The following move is not new in principle, but it has not occurred in this particular position. The timing for it does not seem right to me. 17...Јh4?! 18.f4 ¤g4 19.Ґxg4!? (19.¤xg4 is also possible) 19...hxg4. 20.e5! dxe5 21.¤d3. An elegant way of activating the knight! Less promising is 21.Ґxc5 ¦fc8. 21...exf4. On 21...e4 White plays 22.¤e5! (forking on d7 and g6) 22...¦fd8 (in case of 22...Ґxe5 23.fxe5 the White`s central pawns are devastating) 23.Ґxc5 with advantage. 22.¤xf4 g3 23.hxg3 Јxg3 24.Ґf2. 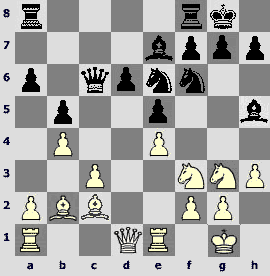 White should have attacked the queen furiously – 24.¦f3! Јg4 25.¤ce2 ¦fe8 26.¦g3 Јh4 27.¦xg6 ¤f6 28.Ґxc5 ¤g4 29.¤h3 with sensible advantage. Now the game becomes sharper. 24...Јg4. Also 24...Јg5!? 25.Ґxc5 ¦fe8 26.d6 ¤f6 is interesting. 25.Ґxc5 ¦fe8 26.d6 ¤f6 27.Ґd4! g5. The White`s position is more pleasant after 27...¦ad8 28.Ґxf6 Ґxf6 29.¤cd5 Јg5 (29...Ґg5 30.Јc3 followed by ¤f6+) 30.¦a3 Ґc6 31.¤xf6+ Јxf6 32.¦d1 g5 33.¤d5. However, Black can obtain an equal game by immediate activating of the light-squared bishop: 27...Ґc6! 28.Ґxf6 (28.b4 g5, and if the knight retreats, the bishop captues on g2, deciding the game) 28...Ґxf6 29.¤cd5 Ґg5 30.¦a3 (if 30.Јc3, 30...Ґxd5 31.¤xd5 ¦e2 gives Black a dangerous counterattack). 29...Ґg7? This natural retreat loses to unobvious and very beautiful combination. Let us examine two other possibilities. b) 29...Ґd8! – this tricky move reveals Black`s ambition. allows 34.e8¤+!! ¦xe8 (bad is 34...Ґxe8 35.Јxb7+ Ґf7 36.Јxb6+-) 35.Јxd7+ ўf6! 36.Јh7. 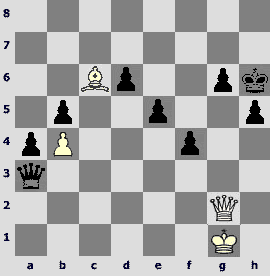 The forced sequence is over, and Black gets a choice, however, there is no winning continuation to be seen. b32) 32...Ґc6 33.¤h3 f4 34.¦a3 (there is no alternative to it) 34...¦e8 35.¦e1, and it looks like the lack of security of the Black`s king allows White to escape, for example, 35...Ґc5 36.Јc2! ўg7 (36...¦xe7 37.¦xe7 Ґxe7 38.¦c3=) 37.Јc3+ ўh7 38.Јc2+ ўh6 39.¤xg5! Ґe3 (otherwise Black is in trouble) 40.¦axe3 fxe3 41.Јh7+ ўxg5 42.Јg7+=. 39...Ґe3+ 40.ўh2 ¦xg2+ 41.ўh3 Ґf4! 42.¦h8+ ўg7 43.¦g8+ ўf6! Niceone! However, after the correct 34.¦ff3! Ґxf3 35.¦xf3 Јg5 36.¦h3+ Ґh6 37.Јxa8 Јxe7 38.Јb8 White is winning. 32.¦ac1! is even more powerful: 32...gxf4 (32...Ґe4 33.¤e6 Ґf6 34.¦f2 ¦e8 35.Јd6+-) 33.¦xc6 bxc6 34.Јd8+ ўh7 35.¦f3+-. 31.¦a3! A tornado of the conbination catches the Black`s king and the White`s queen. 31...gxf4 32.¦h3+ Ґh6 33.¦xh6+! ўxh6 34.¦xf4 ўh5 (34...Јg5 35.¦h4+, and the g6-square is controlled by the knight, which initiated the complications) 35.¦xg4 ўxg4 36.Јd4+ f4 37.Јg7+ ўh5 38.Јg6+ ўh4 39.Јh6+ ўg4 (39...ўg3 40.Јg5+ Ґg4 41.¤f5# is neat) 40.Јh3+. Black resigned. Perhaps the name of the competition may explain the inspired play of the former Russian champion, Alexey Bezgodov, in the following game. 1.e4 c5 2.¤f3 e6 3.d4 cxd4 4.¤xd4 a6 5.¤c3 ¤c6 6.Ґe2 Јc7 7.0-0 b5 8.¤xc6 dxc6 9.f4 Ґb7. 10.f5!? An interesting novelty! This move has never been made so early. One of the common continuations is – 10.Ґf3 followed by 10...Ґc5+ (10...¦d8 and 10...Ґe7 are the alternatives) 11.ўh1 ¤e7 12.f5. Volokitin played this position with both colors and probably decided to avoid it as Black. Andrey lost a game to Areschenko in the Ukrainian championship 2004 after 12...exf5 13.exf5 ¤xf5 14.Ґg4 ¦d8 15.Јe2+ ¤e7 16.¤e4, and as White defeated Predojevic (Budva 2004) after 12...¦d8 13.Јe1 0-0 14.f6 gxf6 15.Ґh6 Ґd6 16.Ґxf8 ¦xf8 17.¤e2. b) 11...¦d8 12.Јe1 ¤f6 13.fxe6 fxe6 14.Ґf4 e5 15.Ґg5 Ґe7 16.a4, and this exhibition game for the German TV, Kramnik-Leko (Cologne 2000), ended in White`s spectacular winning attack. 10...Ґd6. I am firm in my conclusion that refuting novelties is not a commentator`s business. The player sits for hours inventing something new, uses his brains and imagination, suffers doubts, his opponent makes the best of efforts at the board after facing a new move, and after the game someone clicks his computer for 15 minutes and advises with authority: ‘This is how you had to play!`. Isn`t it just ridiculous? One can test 10...e5 or 10...¦d8 11.Јe1 ¤f6, and only further practice will show which of these ideas is sensible, and which is stupid. 11.e5! An excellent sacrifice and a perfect example of ‘freeing a square` combinations! Yet, it is to a great extent forced, as 11.fxe6 can be met by a smart 11...0-0-0! 11...Ґxe5. Played in antique style of Morphy and Andersen opponents: take it if you can. Black has a more cautious move 11...Ґc5+ 12.ўh1 exf5 (12...Јxe5? 13.fxe6) 13.¦xf5 ¤e7 in his possession. 12...Ґxh2+? It is too hastily. Black not only loses a tempo, but also pins his queen to defending the bishop for a while. The real choice is either 12...fxe6 13.Ґh5+ (13.¤e4 ¤e7) 13...g6 14.Ґg4 or 12...¤f6 13.Ґh5 0-0 (not 13...g6 14.Ґg5!) 14.Ґxf7+ ўh8. 13.ўh1. Analytical conscientiousness forces me to add that 13.ўf2 is bad due to 13...Јg3#. 13...fxe6. 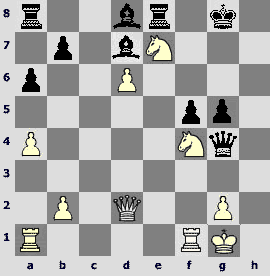 In case of 13...¤f6 White uses a small combination to get an advantage in the endgame – 14.¦xf6! gxf6 15.Јd7+ Јxd7 16.exd7+ ўxd7 17.ўxh2. 14.¤e4. 14.Ґh5+! g6 15.Ґg4 was very strong, for instance, 15...Јd6 16.Јf3 0-0-0 17.¤e4 Јe5 (17...Јc7 18.¤c5) 18.¤g5, or 15...Ґe5 16.Ґxe6 ¤f6 17.Ґg5 ¦f8, and White breaks through the opponent`s defense by 18.¤e4! ¤xe4 19.Ґd7+! Јxd7 20.¦xf8+. However, Alexey`s continuation seems to be no weaker, it only makes the White`s task rather more complicated. 14...Ґe5. In response to 14...c5 I drew the following lines – 15.¤g5 Ґd5 16.c4! (much stronger than winning a rook by ¤f7) 16...bxc4 17.Јa4+ Ґc6 18.Јxc4 Ґd5 19.Јa4+ Ґc6 20.Јg4, winning, or 15...¤f6 16.¤xe6 Јe7 (neither 16...Јc6 17.¤xg7+ ўf7 18.Ґf3, nor 16...Јg3 17.Ґf3 provide satisfactory defense) 17.Ґh5+! g6 (in case of 17...¤xh5 18.Јxh5+ g6 19.Јh3 Black cannot defend against Ґg5 and ¦e1, and, moreover, the h2-bishop is hanging) 18.Ґg5 Јxe6 (18...Ґe5 19.Ґxf6 Ґxf6 20.¦e1 loses the queen) 19.¦xf6 Јe5 (19...Јh3 is parried by a simple 20.Ґf3) 20.Ґg4 Ґd5 (the only defense against Јd7 and ¦e6) 21.Јe1, and the pin on the e-file kills Black. 15.Ґg5. 15.Ґh5+ g6 16.Ґg4 is inaccurate. Black calls for unhuman coolness and achieves a playable position by 16...c5 17.¤g5 ¤f6 18.¤xe6 Јd7! (after normal 18...Јc6 19.Ґh3 White has an edge) 19.Јxd7+ (harmless is 19.Јe2 ¤xg4 20.Јxg4 Ґd5 21.¦e1 Јxe6 22.Јxe6+ Ґxe6 23.¦xe5) 19...ўxd7! (refreshing run on the minefield) 20.¤xc5+ ўc6 21.Ґf3+ (21.¤xb7? ¤xg4) 21...ўxc5 22.Ґxb7 ¦ab8 23.Ґe3+ ўc4. Looks scary, but there is no mate to be found. 15...¤e7. Since the king can`t escape to the queenside, 15...c5 does not work: 16.Ґh5+ g6 17.Јf3!, and now 17...Јg7 is beaten by 18.Ґg4 h6 19.Ґf4, while 17...¤h6!? 18.Ґxh6 0-0-0 (18...gxh5 19.Јxh5+ и 20.¦f7) 19.Ґg4 ¦d4 20.¦ae1 does not bring sufficient compensation for a piece. White successfully develops his initiative after 15...¤f6 16.Ґh5+ ўe7 (16...¤xh5 17.Јxh5+ g6 18.Јg4) 17.Јg4!, threatening to dig to g7 with the queen as well as playing ¦ad1 and ¤c5. The following picturesque line is added for the reader`s enjoyment: 17...¦ag8 18.¤xf6 gxf6 19.¦xf6! Ґxf6 20.Ґxf6+ ўxf6 21.Јh4+ ўe5 (21...¦g5 22.¦f1+; 21...ўg7 22.Јg5+ ўf8 23.Јf6+) 22.¦e1+ ўd6 23.¦d1+ ўe5, and White can either deliever the mate – 24.Јd4+ ўf5 25.¦f1+ ўg5 26.Јg4+ ўh6 27.¦f6+, or, in case of a sudden hallucination, win a queen – 24.Јh2+. 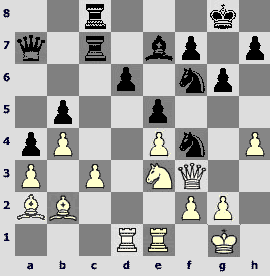 b) 19...Ґxf6 20.¤xf6+ ўg7 (if 20...ўh8, then the knight penetration decides – 21.¤e8! ¦xe8 22.¦f7) 21.¤xh7! ¦g8 22.¦f6! ўxh7 23.¦f7+ ¦g7 24.¦af1 or21...¦h8 22.¦f3! ¦xh7 (otherwise ¦af1) 23.Јf6+ ўh6 24.Ґxg6, mating. 18.¦xf5! exf5 19.Јxf5. Vasnetsov would have been happy about the White`s pieces` deployment. Alas, there is an unfortunate blot on the canvas – an evil warrior among our forces. 19...Ґc8 (19...gxh5 20.Јe6+ ўf8 21.Ґh6+ Ґg7 22.¦f1+, mating) 20.¤f6+ ўf7 (20...Ґxf6 21.Јxf6, and the game will end soon) 21.¤d7+ ўg7 22.Ґf6+ Ґxf6 (22...ўg8 23.Јe6#) 23.Јxf6+ ўh6. 24.¤e5! Having parted with a pawn early in the game, White added an exchange to the fire of his attack, and now he leaves a bishop unprotected. Such limitless generocity is characteristic of all games in this selection, thus the header. 24...Ґe6. 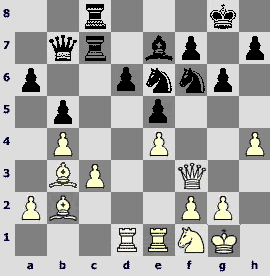 After 24...ўxh5 White will not restore the material justice, but continue 25.g4+ Ґxg4 26.ўg2 with inevitable mate. Defending the f7 by 24...¦a7 does not save in view of 25.Јxh8 ўxh5 26.¦e1!, and if Black prevents the idea ¦e4 and g2-g4+ by 26...Ґf5, then 27.g4+! Ґxg4 28.¤xg4 ўxg4 29.Јf6 with devastating effect. 25.Ґxg6! Avoiding the trap 25.Јxe6 ¦ae8 26.¤g4+ ўg5! 27.Јf6+ ўxh5. 25...Јd8 (25...Јg7 26.Јh4#) 26.Јxe6 Јh4+ 27.ўg1 Јd4+ 28.ўf1 ¦hf8+. After 28...Јd5 29.Јf6 the White`s queen is ready to deliver the finishing blow. 29.Ґf5+. Whatever you do – 29...ўg7 30.Јe7+ or 29...ўg5 30.¤f3+ – it`s mate. Black resigns. Great master of attack, five-time champion of RSFSR Rashid Nezhmetdinov would have appreciated the actions of his successor.